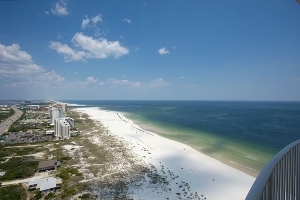 Discover Orange Beach Condos on the glorious Gulf Coast. Blessed with pristine beaches and bathed in magnificent light, Orange Beach, Alabama is the perfect antidote to the many crowded resorts in nearby Florida. This magnificent area has all that a Gulf Coast home seeker could want, and the Orange Beach real estate market is positively bursting with great beach houses and condominiums for sale. Whether you are looking for a year-round residence with great access to the shore and local dining and shopping, or a stunning vacation condo with unrivalled views, Orange Beach is the perfect place to start your Gulf Coast home search. Real estate buyers will find an excellent select of condos in Orange Beach, as well as beachfront properties and single-family homes. Discover more about Orange Beach condos, or see all Orange Beach condos for sale below. You can also view listings by condominium development. Sign up now for FREE for complete access to Orange Beach condo listings, including detailed property specs, area maps, photos and more! Registration also enables you to bookmark your favorite condos, share listings with friends & family, and save your preferred search parameters to save you time on your next visit. Orange Beach Condos such as Admirals Quarters and Tidewater offer uncrowded beaches and attract many summer visitors. For high-end luxury, Turquoise Place, Opal, Phoenix IX and Phoenix West offer stunning architecture and spacious living. There are several boating communities in Orange Beach that, through Perdido Pass, offer direct access to the Gulf of Mexico. Sportsman's Marina and Zeke's Marina have outstanding facilities for all types of boats — from the weekend boater to charter fishing boats. Many developments such as The Moorings, Mariner Pass, and Phoenix on the Bay have high-end condominiums with assigned boat slips, while Bella Luna and Caribe Resort have outstanding amenities and beach access. For those living in the Orange Beach area, life is good! The expansive Gulf State Park is right on one's doorstep, where families can explore the area's wilderness and wildlife, while golfers can enjoy the facilities at Orange Beach Golf Center and a host of other nearby courses. If you enjoy water sports, then Orange Beach is the place for you. You can fish, water ski and surf to your heart's content because no matter where you are in Orange Beach, the open water is never far away. Those who own Orange Beach property know that this small city, situated on the southeast coast of Alabama, is home to only about 4,000 residents. The population swells considerably throughout the summer months as thousands of fun-seeking vacationers head to the area to take advantage of the city's wonderful beaches, fishing and entertainment options. When it comes to restaurants and bars in Orange Beach, be sure to check out Tacky Jack's Bar & Grill (also has a cigar bar), and Cosmos Restaurant & Bar. To learn more about Orange Beach condos, please contact the Gatti Team.